Every 24 minutes another woman is diagnosed with ovarian cancer. All of them have a story. Share your #OvarianStory with us below, and we may share it with our community. Tell your story on social media to raise awareness of ovarian cancer, from the first often-missed symptoms, to diagnosis and beyond. By speaking out to your own friends, family and colleagues about your own experience, you can help other women and shine a spotlight on this disease. 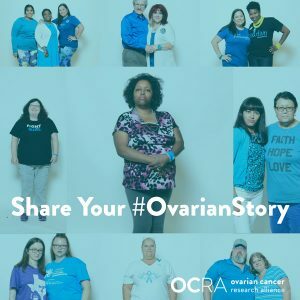 Tell your story with tag #OvarianStory on your own social networks, and follow OCRA on Facebook, Twitter and Instagram for more ways to take action. I agree that the content submitted may be shared on OCRA’s website and social media, and in digital and print communications. I'd like my story to remain anonymous; please do not share it.